With winter slowly creeping closer, it's time to start digging out the coats and jackets and mentally preparing for the next six months of cold weather. As we all know, though, while you can often keep some of your body warm, you're never truly comfortable if a part of you is feeling the cold. But what if, instead of adding more layers every winter, you could to turn to a piece of wearable tech and improve how you battle the elements? And not just that – what if the same piece of kit could also cool you down in summer? Back in an air conditioned lab at MIT in 2013, those same questions are what led Embr Labs co-founders, Sam Shames, Matt Smith and David Cohen-Tanugi, to provide a solution to temperature woes. 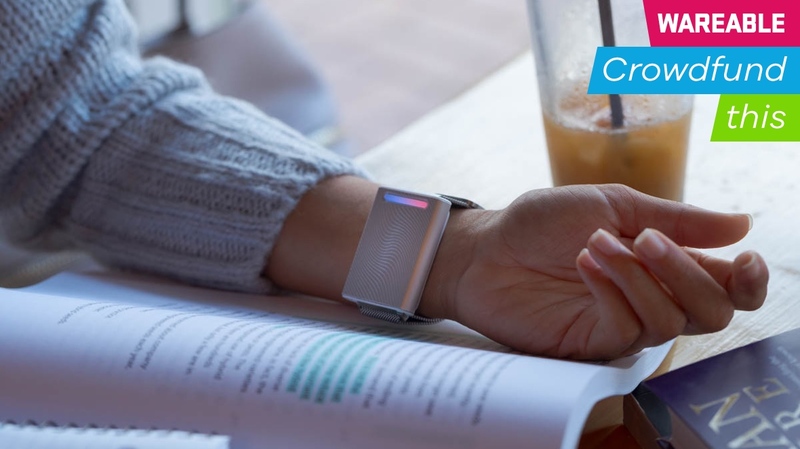 And after years of development, the startup's wearable, the $219 Embr Wave, is now on Kickstarter, raising $500,000 already on a $100,000 target. "Our initial idea was actually to help buildings save energy. We got the idea in a lab on a hot May day in Cambridge, and the place was so air-conditioned we had to put on sweatshirts," Shames told us. "We were saying to each other, 'This is ridiculous, it's using so much energy and this lab is empty most of the day'. So from there we just wanted to affect people's temperature directly. "After our first prototype that summer, we realised that, while it can save energy, there's a much more immediate value – simply, feeling the right temperature feels good." Working from that premise, Embr Labs began to research the science around human body temperature and develop its device. The trio found that warming or cooling one spot on the body can improve overall comfort without necessarily changing the body's core temperature, while also trying to factor in our natural ability to respond to a sudden temperature change. "Think about if you're in a shower, it might feel hot at first but you soon get used to it and want to turn it up. So, with the Embr Wave, we can replicate that sensation with the pulses and leverage the body's and our skin receptor's natural responses to change," Shames explained. It wasn't all straightforward, though. As Shames noted, the team's first challenge was understanding the subject area before then applying it to technology. And even from there, shrinking this into a wearable form factor proved tricky. With the wrist providing solid blood flow for a band to tap into, Embr Labs' next move also included taking everything it had learned and making it an attractive and discreet package that users wouldn't mind wearing. The result was a 50 x 13 x 32mm wristband that offers 16 temperature intensity levels, from 'very cold' to 'very warm', while also accommodating for around three days (or 25-50 relief 'sessions') on a single charge. "When we started the product, the Apple Watch wasn't out yet and the main wrist based products were Fitbit devices," said Shames. "But obviously, as we've worked to get to market, it exploded and managed to sustain itself. The wrist is an area that people don't mind putting on a new thing, and it's also a very thermally sensitive area. "Initially, we couldn't make something attractive enough that people would want to wear. It wasn't until 2015 that we made something that, when people would wear it during field trials, the feedback was that they actually wore it all day. And, of course, we learned very early on that it needs to be something people actually want on their wrist all the time," he continued. So, why the delay to head to market? Well, understanding the potentially shaky ground startups developing their first device can tread on, Embr Labs opted to take a more pragmatic approach. Since finishing the design of the Wave last autumn, the company has worked to shore up any potential hurdles in the manufacturing process. And according to Shames, an engineered sample run of the device has already taken place on an assembly line with a high yield. So for Embr Labs, it's now a case of fulfilling the ascending mountain of Kickstarter orders. But the overall plan runs deeper than just one device that heats and cools you when you need it most – Embr is exploring the application of its patented technology in a number of other areas, such as virtual reality, entertainment and non-verbal communication. This long-term vision and potential is likely why the MIT-founded startup has attracted support from two significant players in the tech space, Intel Capital and Bose Ventures. For now, that relationship includes capital injection, but is something we suspect could broaden the technology in the immediate future. Since we haven't yet had chance to test out the technology behind the Embr Wave, aside from a brief demo of a very early prototype, it's hard to speak to just how effective it is at helping you gain more control with regard to temperature. However, it would appear Embr Labs has carefully developed an innovative wearable concept, and one that's resonated not just with big industry players, but also Kickstarter backers. Anecdotally, there is a lot of demand from women, whose comfort levels based on temperature fluctuate for all sorts of reasons, for this kind of instant "thermal relief". Although the manufacturing process is never a sure thing, either, the fact this is already locked in place is an encouraging sign it will deliver in time for the first wave of mailouts. The Kickstarter price is $219, with shipping in batches in February and July 2018 and the Wave will retail for $299 from November 2018. We imagine the design will be a contentious point for those who are used to wearing a watch or simply prefer something smaller on their wrist, but, still, for anyone who wants to feel an instant hit of heating or cooling on their wrist, we imagine this is a no-brainer. Mere months of making do with the splash of the cold tap, then.